TORONTO, Feb. 8, 2018 /CNW/ - First Cobalt Corp. (TSX-V: FCC, ASX: FCC, OTCQB: FTSSF) (the "Company") is pleased to announce high grade cobalt assays up to 2.01% cobalt from surface sampling near the past producing Hamilton mine in Cobalt North. "We are continuing to validate these high grade areas of the Cobalt Camp. Broader mineralized systems with lower average grades are more attractive longer term targets as they hold potential for large low-cost, open pit operations," commented President & Chief Executive Officer, Trent Mell. "These high grade areas may represent the centre of a broader mineralized system similar to the zones recently identified in Cobalt South. The high grade zones could provide early feed for startup operations. Hamilton is one of several areas we plan to explore in 2018 with more than 15,000 metres planned in Cobalt North." 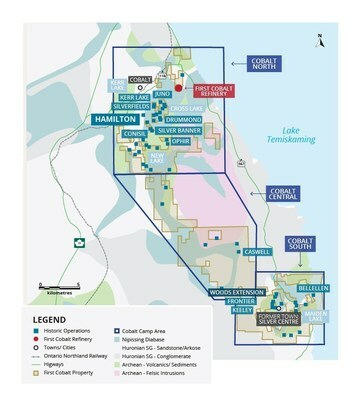 Hamilton is one of 50 mines that First Cobalt controls in the Cobalt Camp. Four shafts occur along a 400-metre east-west vein system in the Hamilton mine area following discovery in 1908. The Hamilton shaft is 33 metres deep with mining along three levels up to 75m west of the shaft. Production was only recorded for 1938, listing 112 pounds of cobalt for every ounce of silver. The Hamilton area has not been active since 1956 due to the generally low silver content compared to other historic mines nearby in Cobalt North, such as Silverfields, Nipissing and Crown Reserve.